We are not far from the redundant St James the Less, now the Norwich Puppet Theatre, on Herbert Rowley's inner ring road. Past one of the best-preserved fragments of the medieval city wall, Silver Road rises pleasingly towards Sprowston, attractive Victorian terraces on either side, and stunning views back to the Anglican Cathedral. Near the top of the hill, this large structure comes into sight. I had actually been looking for the Church of England parish church of St Mary Magdalen fifty metres further along, but that church is rather restrained in comparison with this prominent castle of a chapel crowning the rise. Silver Street Baptist Church is a good example of that early 20th Century enthusiasm: an ecclesiastical village. That is to say, several buildings for different Church purposes built together on the same site, distinct but joined together to make a structure larger than simply the church itself. 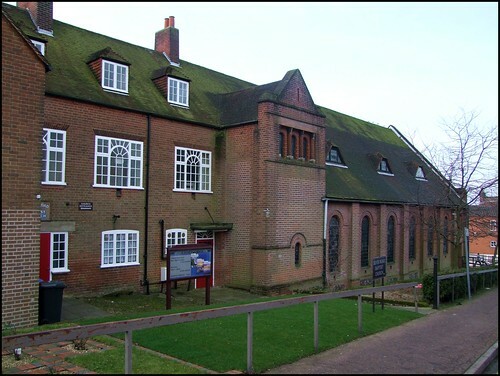 Seen from the north on Mousehold Avenue, the long building stretches confidently below the roadline, with what was probably the school becoming a hall and then the church itself. To the south, the complex is completed by modern apartments belonging to the English Churches Housing Association. A round plaque above a doorway in the north-west corner is badly eroded, but gives the date of construction as 1910. The style of the church is largely neo-Norman, but with those neo-Byzantine decorative details which had been made popular by the construction in England a decade earlier of the Catholic Westminster Cathedral. And there are some beautiful details in the west window capitals: a squirrel and a hare are echoes of medieval ancestors. In contrast to the grandeur of its west end, the entrance today is a little doorway along the north side. Unaccountably, This handsome structure was missed by by both Pevsner and Bill Wilson, his revising editor. This is a pity, because it would be interesting to know who the architect was.